I shall report on the game starting tomorrow. You need to watch the video of our grandson Sammy, who is now 27 months old. He and his Dad watch sports continually and Sammy knows the WVU football stars. Sammy's favorite is Pat White, quaterback for WVU. Pat is an exceptional player. 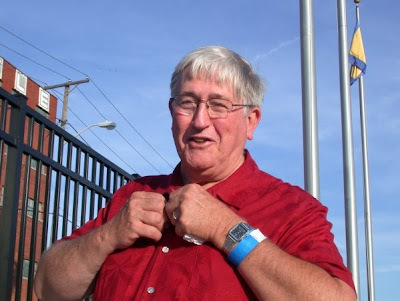 Sammy also goes to the games and sings John Denver's "Country Roads". At 2 years and 3 months, we think his verbal skills are amazing. Bet John Denver would have never guessed that his song would be presented in this format and with this dance routine. Enjoy this short video! 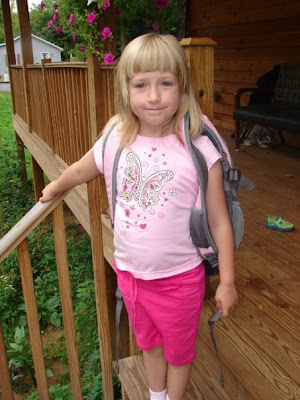 This Tuesday Flora started kindergarten at Shepherdstown Elementary. 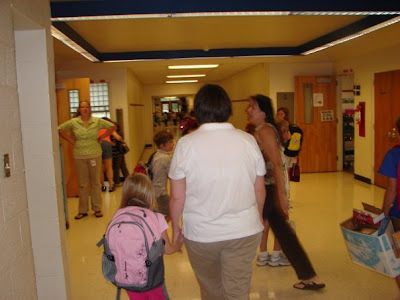 As you see above, our grandkid in pink has backpack ready and her mission this morning is to check out the school and her teacher. I am certain that, as Flora entered the school, her eyes and ears were absorbing every detail. 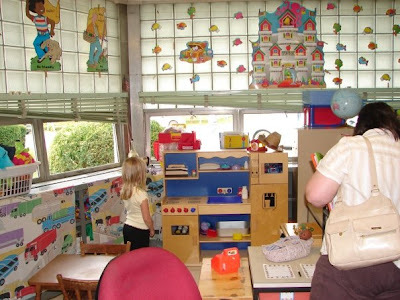 Her room is light and cheery. It even has this neat kitchen unit. It does not take Flora long to make friends. We are most likely making Grandma Great's chocolate cherry cake. 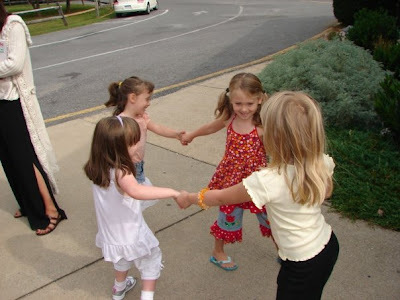 Rachael said that it was only a very short time period before Flora had gathered a group and said "Wanna play Duck, Duck, Goose?" 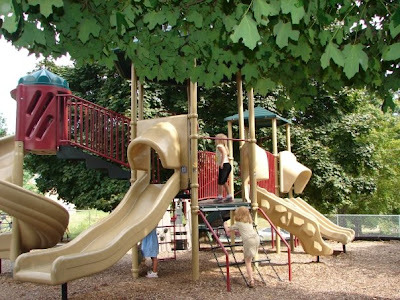 The outdoor play area looks great. In summary, Dad John said it best when asked how Flora did on her first day. He responded, "Like a duck to water!" 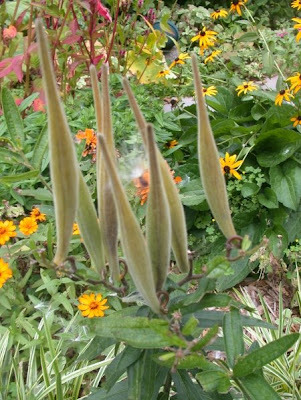 Remember the lovely photo above of our butterfly weeds that was posted on our blog early in the summer? Well, my friends, the fall season is upon us. The butterfly weeds have now fruited and are casting their silky seeds. It is easly to tell these critters are members of the milkweed family. I am always amazed with some of the uses described for different species of plants. For example, butterfly milkweed has, according to a variety of sources, many medicinal uses. 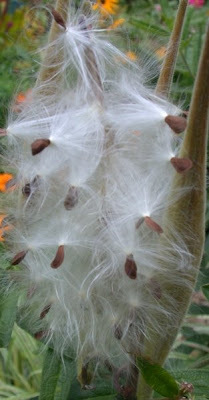 The Omahas and Poncas ate the raw root of the butterfly milkweed for bronchial and pulmonary troubles. Butterfly milkweed root was also chewed and placed on wounds, or dried, pulverized, and blown into wounds. The Omaha tribe used butterfly milkweed medicine for rites belonging to the Shell Society. 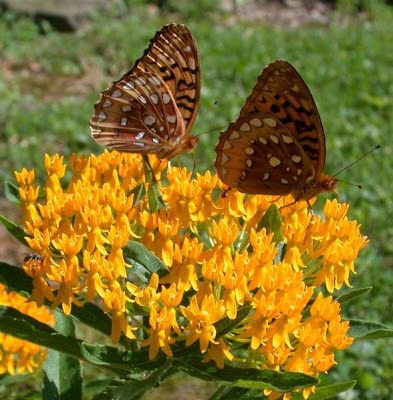 The Dakotas used the butterfly milkweed as an emetic. The Menominis considered the butterfly milkweed, which they called the "deceiver," one of their most important medicines. 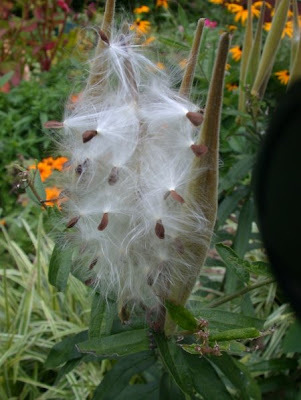 Generalized medicinal uses for milkweed species include 1) its use in a salve for scrofulous swelling, 2) as a diarrhea medicine, 3) drunk by mothers unable to produce milk, 4) medicine for snow blindness and other forms of blindness, 5) relief of sore throat, 6) applied chewed root for swelling and rashes, 7) to expel tapeworm, 8) to treat colic, 9) to act as contraceptives, and 10) to cure snakebite. I do think that I would try alternative medications for the eight medicinal used listed above! My reasoning is that milkweed species, as a group, are known to contain cardiac glycosides that are poisonous both to humans and to livestock, as well as other substances that may account for their medicinal effect. Resinoids, glycosides, and a small amount of alkaloids are present in all parts of the plant. Symptoms of poisoning by the cardiac glycosides include dullness, weakness, bloating, inability to stand or walk, high body temperature, rapid and weak pulse, difficulty breathing, dilated pupils, spasms, and coma. This plant was extremely interesting when I taught entomology. The cardiac glycoside in milkweed has also been useful as a chemical defense for monarch butterflies (Danaus plexippus). Chemicals from the milkweed plant make the monarch caterpillar's flesh distasteful to most predators. Monarch butterflies are specific to milkweed plants. This is the only type of plant on which the eggs are laid and the larvae will feed and mature into a chrysalis. Eggs are laid on the underside of young healthy leaves. Monarch, Queen, and Viceroy butterflies are Müllerian mimics, all are toxic, and have co-evolved similar warning patterns to avoid predation. Judy did wonderfully and did as Dan Johnson, our State Farm agent always says "Hit the sucker and DO NOT SWERVE TO MISS THE DEER." According to State Farm Insurance(R) claims data, the vehicles that are most likely to collide with a deer are in West Virginia. 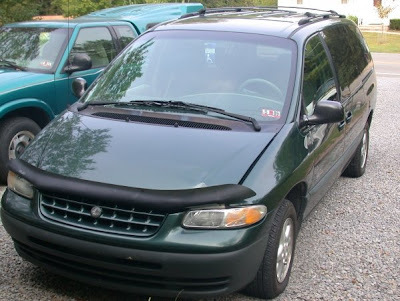 Using its deer claims data from the last half of 2006 and the first half of 2007 and motor vehicle registration counts by state from the Federal Highway Administration, State Farm estimates the chances of a West Virginia vehicle colliding with a deer over the next 12months at 1 in 57. That is nearly three times more likely than one estimate of thepossibility that a person will be audited by the Internal Revenue Service in 2008 and 5,000 times more likely than another approximation of the chance that an individual will be struck by lightning between now and a year from now. We were lucky in regard to vehicle damage. 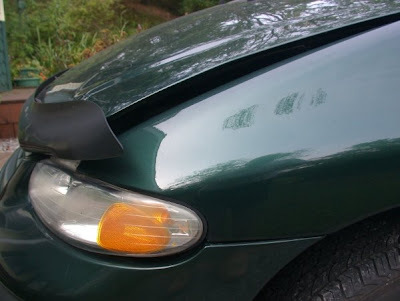 The deer somehow missed denting the sides and the only damage occurred on the hood. We see our friendly State Farm adjustor on Thursday. There is no deductible required for der collisions. 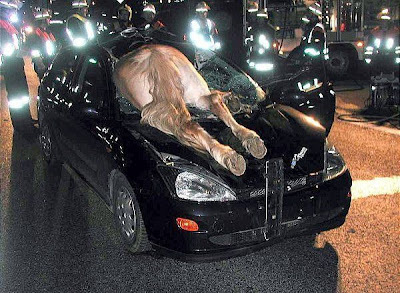 I am always amazed when folks have collisons with other large animals. Moose would be a deadly possibility with it's weight and high center of gravity. How about the horse below? Yep, we are extremely lucky! Before we left Charleston on Saturday. 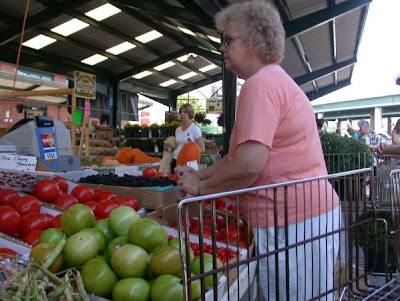 Judy wanted to stop by the Capitol Farmers Market and get fresh produce. 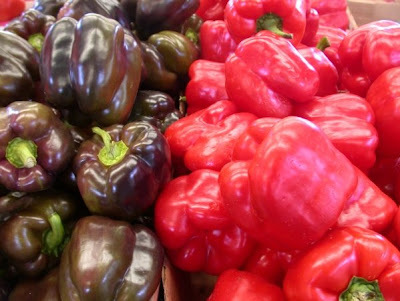 It is a wonderful array of fresh veggies and fruits. 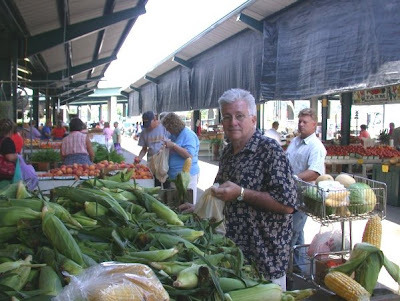 The market is a delight to visit at all seasons. 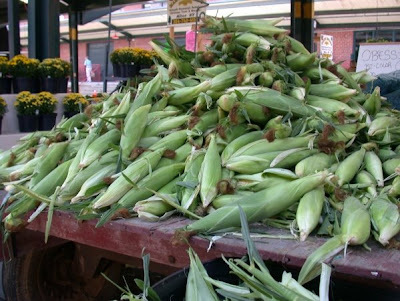 We love spring at the market. At this time, the vendors always present an outstanding display of flowers. Tis really beautiful! 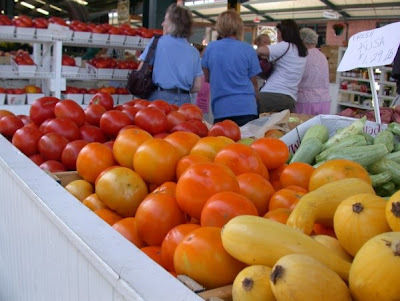 If you are not familar with this market, Capitol Market is located on a portion of the rail yards property originally developed by the New York Central Railroad Company in the late 1800's. The only remaining building was originally a transfer dock and warehouse for the railroad. It had been used for years to transfer goods from rail to truck for distribution. In the 1970's the rail yard business ceased and for many decades the building was neglected or sporadically utilized for storage and recycling. 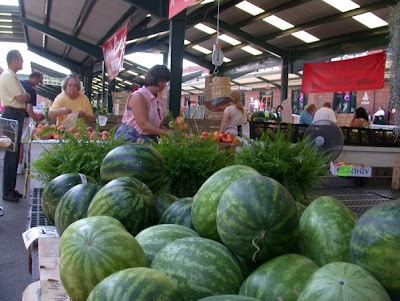 Revitalization came in the mid 1990's as Charleston Renaissance spearheaded a task force which included officials from the City of Charleston, Kanawha County, Charleston Urban Renewal, West Virginia Department of Agriculture and the Sate of West Virginia to create what is now Capitol Market. 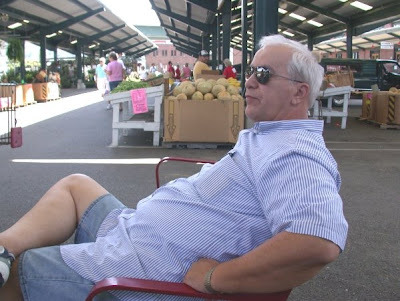 The Market is located on the north end of Capitol Street in downtown Charleston, West Virginia. It opened in 1997. 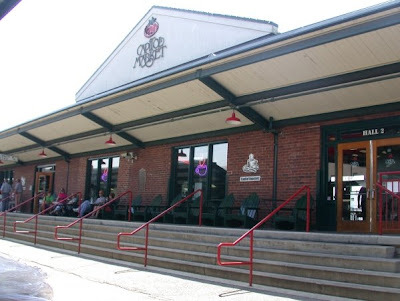 Today you will see an eclectically designed and renovated railroad transfer dock that captures the essence of an outdoor farmers' market and plays host to many indoor specialty shops featuring everything from fresh, simple foods to gourmet pleasures and including a full-scale restaurant serving fine Italian cuisine. Above is Judy doing OUR shopping! 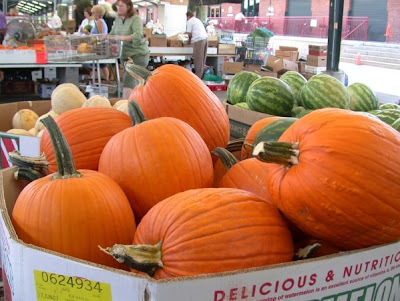 It will be not long when the season arrives when the pumpkins will be dominating the scene. I had to select the corn. See I shop - with the urging of the wife! If you all have never experienced the market, it is well worth a visit. 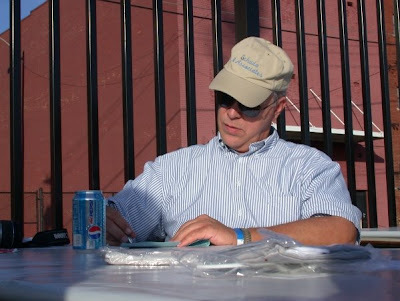 Pix and Dan invited us to Charleston on Friday evening to attend the GSC Alumni Gathering at the Appalachian Power Baseball Park. 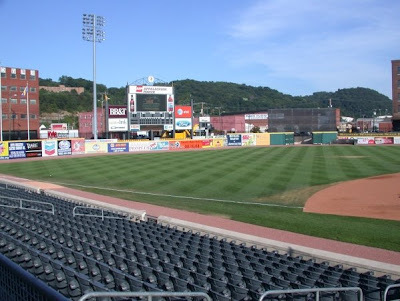 We remember when the old Charleston’s minor league team, the Alley Cats, played at Watt Powell Park in Kanawha City — the home of minor league baseball for half a century. I think I may have attended one event at the old park. I guess Watt Powell and the Alley Cats were out of step with what was happening in professional baseball nationally. Fans weren’t eager to watch games in a dilapidated relic of a baseball park. 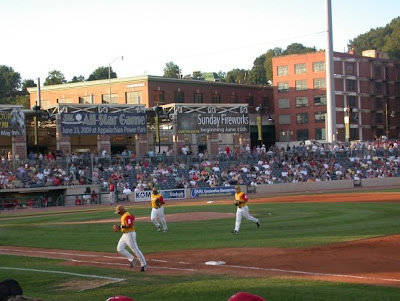 A new baseball field in downtown Charleston — Appalachian Power Park — opened the door in 2005 for the renaissance of baseball in the state capital. 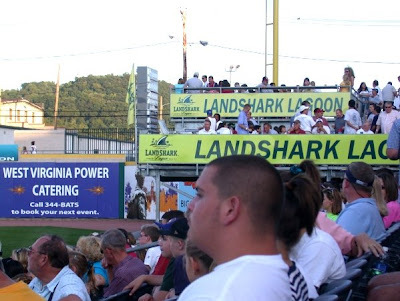 Renamed the West Virginia Power, Charleston’s entry in the South Atlantic League debuted in spring 2005 in the shiny new ballpark. The four of us attended the GSC buffet. 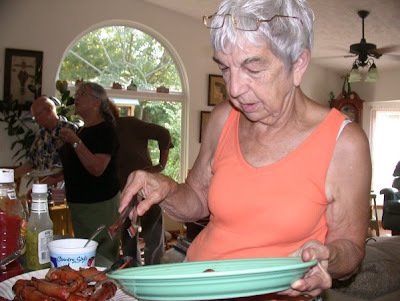 (OK- we give the food a C- at the best - this review has been emailed directly to the Food Network) We did however enjoy meeting old friends and making new ones. 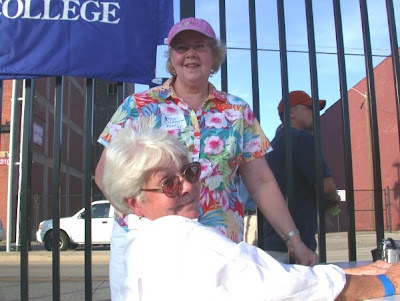 Our friend, Janet Bailey, who is a GSC faculty member, greeted us at the entrance to the park. Here is a new lad that has just been hired on the GSC campus, Danny Nicholson. 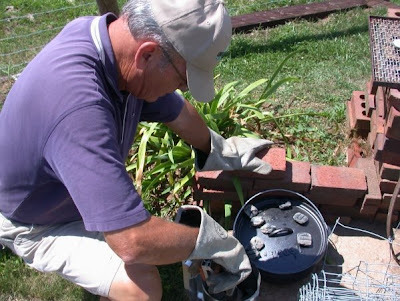 We were impressed with his enthusiasm and people skills. You would think Dan is busy studying the statistics for the upcoming game. He is really filling out a form that may be chosen from 10,000 others to win a prize. (Fries at McDonalds, free smoothie from Target, and other equally impressive prizes) It is time to play ball! 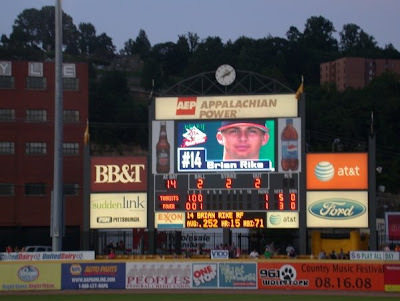 The Power played the Ashville Tourists. We left around midway through the game. We needed to retreat to Pix and Dan's for some fresh peach cobbler. 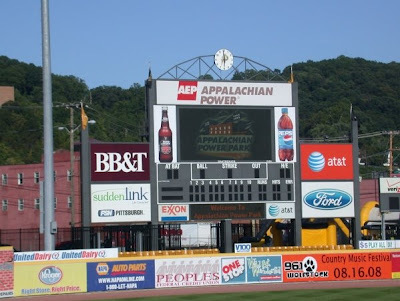 By the way, the Appalachian Power team did win - so says the Charleston Gazette. I would love to have participated in the games that appeared between innings. 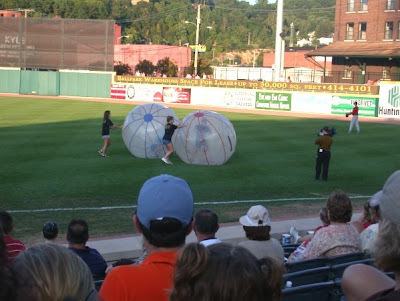 I know I could have easily won over Dan in this rolling ball event. 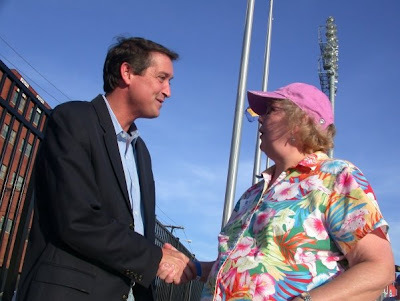 Judy and I enjoyed the evening with Pix and Dan, but we have doubts that we would purchase season tickets to the baseball games. 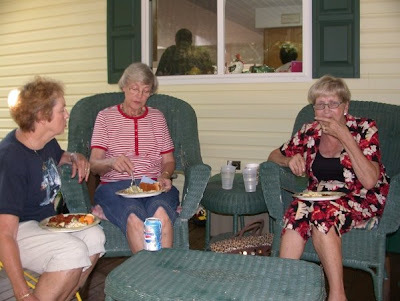 Yesterday we hosted the August Folk Festival picnic. 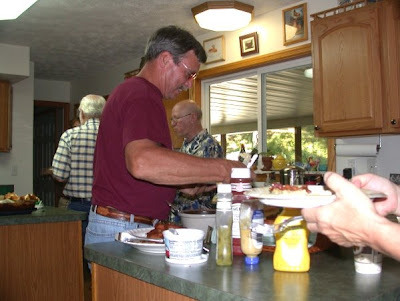 I am posting a few photos of the occasion. We grilled hotdogs wrapped in bacon. The folks brought an amazing array of covered dishes. Above Sadie Kelble, President, is transferring the hot dogs so that eating can begin! Lynn, Mary Ann, Buddy, and Donna look as if they are ready for a dance routine. How does Buddy always manage to get with the ladies? It must be his expert fiddle playing! You have to love Deb's t-shirt. 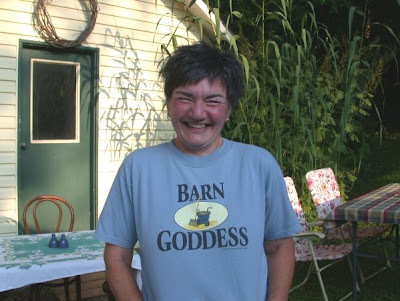 She and Bruce raise Coopworth Sheep so Deb is quite familiar with her barn. Just a reminder about tomorrow night's meteor shower. Here is an excerpt from MSNBC. com. Every August, just when many people go vacationing in the country where skies are dark, the best-known meteor shower makes its appearance. It is also the month of "The Tears of St. Lawrence," more commonly known as the Perseid meteor shower. 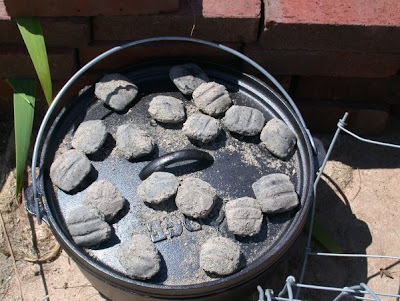 Laurentius, a Christian deacon, is said to have been martyred by the Romans in the year 258 on an iron outdoor stove. It was in the midst of this torture that Laurentius cried out: "I am already roasted on one side and, if thou wouldst have me well cooked, it is time to turn me on the other." The saint's death was commemorated on his feast day, Aug. 10. King Philip II of Spain built his monastery place, the "Escorial," on the plan of the holy gridiron. And the abundance of shooting stars seen annually between Aug. 8 and 14 have come to be known as St. Lawrence's "fiery tears." Viewing prospectsIn 2008, the Perseids are expected to reach their maximum on Tuesday. The time of maximum should be about 1100 GMT (7 a.m. ET) on Aug. 12, Margaret Campbell-Brown and Peter Brown report in the 2008 Observer's Handbook of the Royal Astronomical Society of Canada. If so, the timing is very good for meteor watchers observing before dawn in North America, especially in the western states. And that morning, the waxing gibbous moon sets around 1:30 a.m. local daylight saving time, leaving a dark sky for the following three hours. Take full advantage of that moonless period. Next year, a last-quarter moon will illuminate the after-midnight sky with its light and will hinder observation of the Perseids. We know today that these meteors are actually the dross of Comet Swift-Tuttle. Discovered back in 1862, this comet takes approximately 130 years to circle the sun. And in much the same way that the Tempel-Tuttle comet leaves a trail of debris along its orbit to produce the Leonid meteors of November, Comet Swift-Tuttle produces a similar debris trail along its orbit to cause the Perseids. Every year during mid-August, when Earth passes close to the orbit of Swift-Tuttle, the material left behind by the comet from its previous visits rams into our atmosphere at approximately 37 miles (60 kilometers) per second and creates bright streaks of light in our midsummer skies. My better half had an adventure. Yesterday morning at 10 A.M. the good wife, Sarah, and Sammy flew out of the Bridgeport airport. 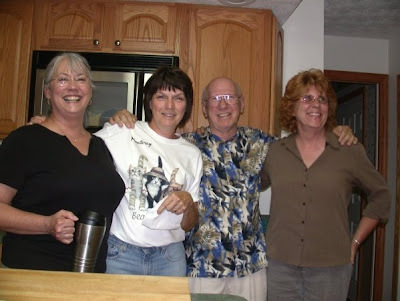 The trio is visiting our friend Sally in Plattsburg, New York. Their itinerary involved a short stop in Morgantown, arrive at Dulles in Washington D.C. (short lay over), and then off to Burlington, Vermont. Sarah had a car rented in Burlington so they could drive from the airport, take the ferry across Lake Champlain, and then to Sally’s house. They were to get into Vermont around 2:30 P.M. Sarah asked Mom’s help in traveling with Sammy (2 ½ years old) so Judy readily volunteered. 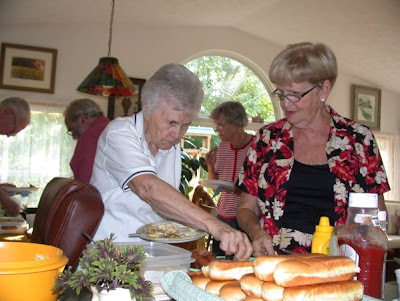 Since Judy was traveling, I headed to Spencer to visit Mom Meads and sister Judy. 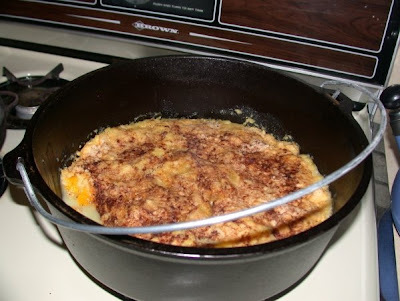 Judy fixed supper for us and brother-in-lay Bill fixed peach cobbler in his new iron Dutch oven. 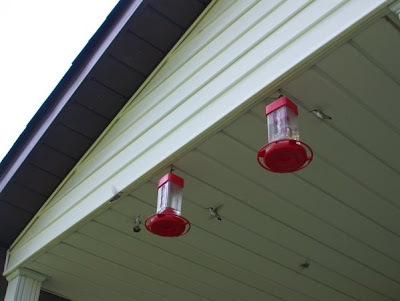 We watched the great number of hummingbirds that came to the feeders on their porch. I had not heard from the travelers in the late afternoon, which I thought was a bit odd. Here is their story. Upon arriving at the gate in D.C., there were only 2 seats on the plane left. Mom let Sammy and Sarah take this flight. She would have to wait until about 5 P.M. to get another flight to Burlington. Poor Sarah- no help with Sammy at this time Sarah’s plane was delayed because they had to change an oil filter. In the meantime, she is trying to change diapers (without benefit of water) and get Sammy settled. Sammy cried the last ½ hour of the flight because of the “ear effect” when the plane drops altitude. Sarah called me around 3:30 and said 66.66 % of the travelers had arrived. 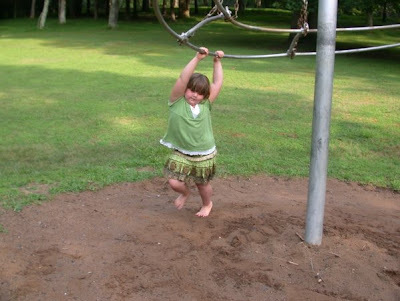 She was tired and discouraged. She had Sam, all the luggage, and now was planning to try to get everything into the rental car - and then hopefully meet Mom. Judy is a wonderful lady and we have had so much fun and love in our marriage. 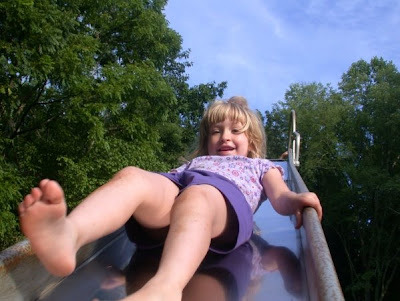 There is a slight problem and it involves her orientation – I was worried! When we go to the mall where we have been a plethora of times, she forgets in which direction stores like Target are located. Judy is now alone in the D.C. airport. Her story continues. She waited to board with her tickets and boarding pass. As she gets to the plane’s door, the ticket lady says that she was at the wrong gate and that she needs to go to another quickly. Yes, quickly since the other plane was leaving in 10 minutes! The other gate was located a far distance from where she was then. She hopped on a shuttle. 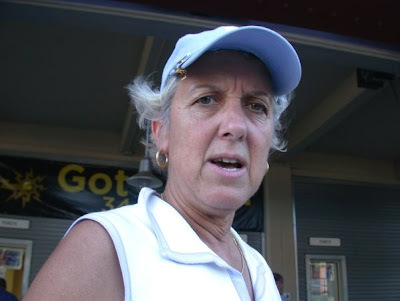 When she asked if that shuttle was going to her new gate, the guy said “No, we are going to the terminal!” Judy flew off that shuttle and she found another that deposited her at the gate with 1 minute to spare. One problem – during the confusion, she has lost her boarding pass! The lad in the seat beside Judy mentioned that this particular flight was late 70% of the time and 7% of the time it is cancelled and does not fly! He was correct. They were to get into Burlington at 6:39 P.M. and they actually arrived after 7:30 P.M. Poor Sarah and Sam waited at the airport for Mom from 3:30 until 7:30. I was called at 7:45 to tell me that all travelers were reunited. Hurray! After eating and changing diapers, Judy, Sarah, and Sammy did not get onto the road until around 10 P.M. I was trying to watch the 2008 Olympic Opening Ceremony, but had the girls and Sammy firmly in my thoughts. I called about 11 P.M. The travelers were at that time on the ferry heading to Plattsburg. It had been 13 hours since they left Bridgeport. I told Judy that it takes us about 6 hours to fly from Pittsburg to Seattle, Washington! The excitement did stop there. They had Sarah’s GPS system to help them find Sally’s house. It seems that either the GPS or the drivers were confused since they kept circling the peninsula. They were very clever to figure this out when they passed the same deer eating grass in a ditch on four separate occasions. 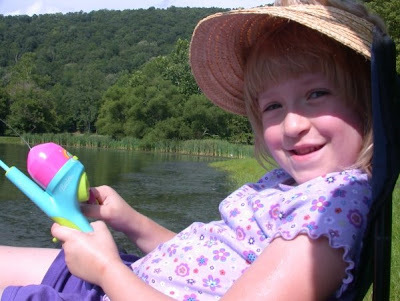 Sarah hit a skunk – that was another marker which indicated that they were traveling in circles. Sarah did notice the “Watch Out For Moose” signs. That is all they needed to hit a moose! After 14 hours of traveling, they finally arrived at Sally’s around midnight! Oh, the adventures, I am certain, will continue. I shall keep you informed. Yesterday's rains stopped in the afternoon and the sky cleared. Flora said that fishing is on the agenda. Grand parents did not disagree. 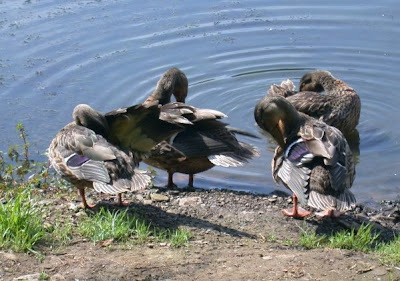 When we arrived at Cedar Creek State Park, a group of blue-winged teals were busily preening themselves. 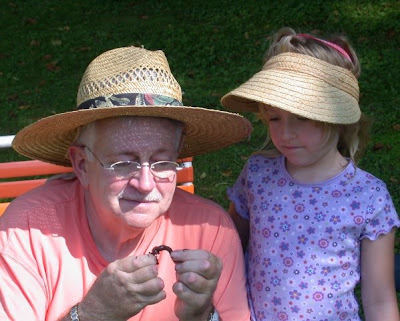 Grandpa shows Flora the winning technique of placing a night crawler on the hook. Miss Flora does so well at casting out her line. 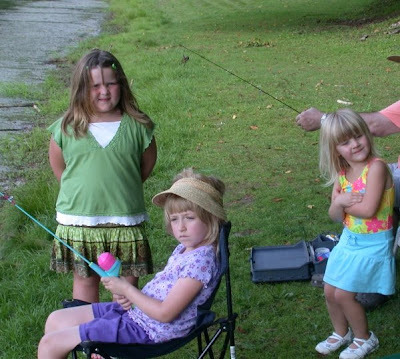 I suppect it is the official Barbie fishing pole that Grandma and Grandpa purchased for her. 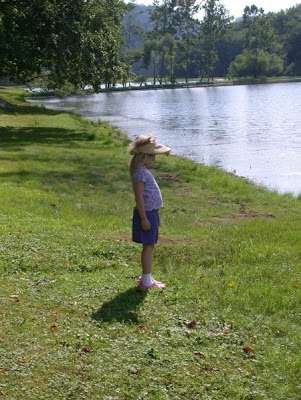 This is the life - fine weather, fine fishing, and a fine fishing hat! As we were fishing some friends showed up on our pond bank. Why, it is Kaylene and Daisy! 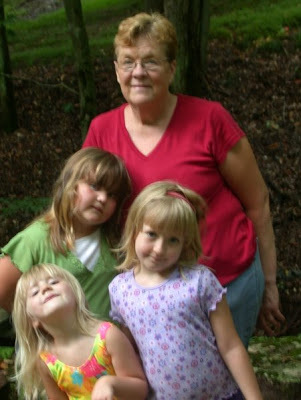 These are two of the grand daughters of our friend, Sharon. Here is Sharon with the three gals. 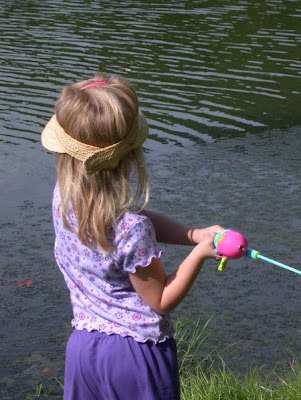 Oh, for some reason fishing took a backseat when the thoughts of playing on the play ground equipment came into our discussion. 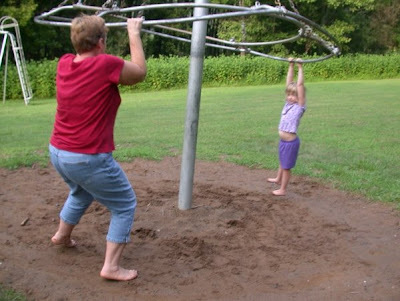 The kids, Grandma, and Sharon were off to the swings. 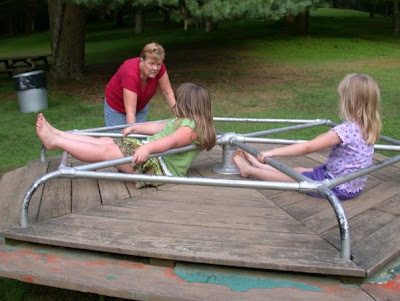 Amazing that the play ground equipment at Cedar Creek is the same as when the park opened. 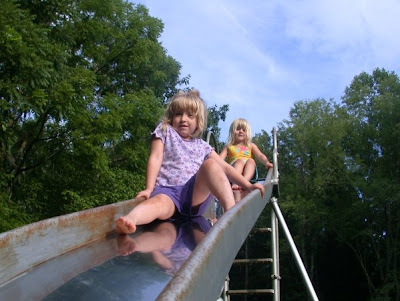 The gals loved the tall slide. Miss Sharon helped the kids on what she describes at the Witch's Tree. 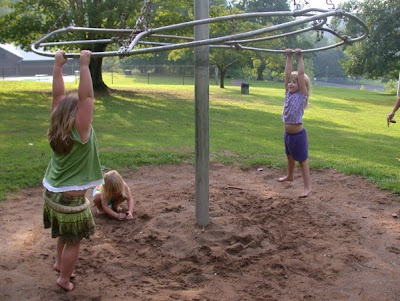 Up in the air and around and around - the kids love this type of play. 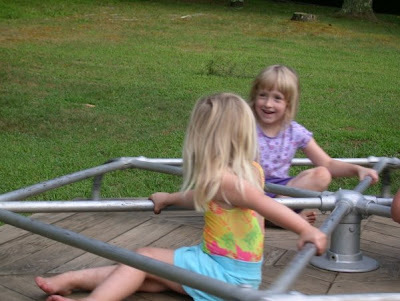 The final ride was the merry-go-round. This was also powered by Sharon. Where were Grandma and Grandpa? We were being amazed at Sharon's strength and energy. It was certainly a fun and full final day for Flora at Grandma and Grandpa Meads house. 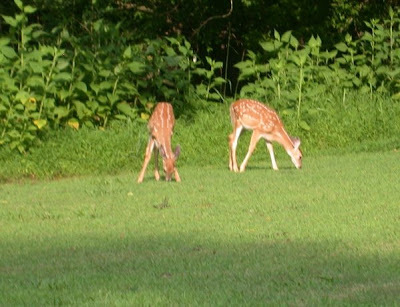 As we left the playgound, a doe exited the bush with her two fawns. Supper was pizza from Pizza Hut. Of course, Flora had to have her bath before eating. Night crawler juice and playground mud does not improve the taste of pizza!